Smooth legs and smooth strokes. 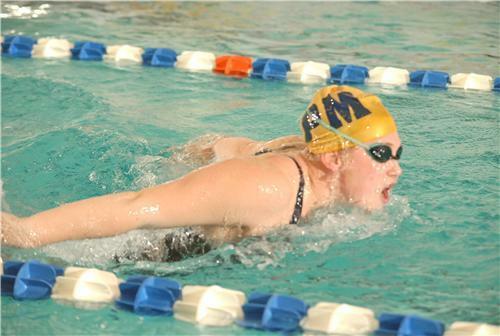 This is the Penn Manor swim team. Instead of running or skating, these Comets are propelling themselves through the water. Some argue that swimming isn’t even a sport. But those who are apart of the team would beg to differ. Either way, the team goes through an extremely tough practice schedule. According to senior swimmer Frank Herr, the practices start off with a warm up of various strokes for fifteen minutes. Then they complete ‘transition sets’, which are strict routines for twenty minutes. Then they move into the ‘long set’, which is the very difficult endurance portion of the practice. Then more drills ensue. After this is a ‘semi-long set’, which is also difficult. The practice concludes with an ‘easy set’ to cool down. The team has seen a lot of success that for some reason or another struggles to garner any attention. But no matter how hard they work and succeed, they can never find the publicity they deserve. The meets are a series of various events where both the boys and girls teams compete for the same goal, to defeat the opponent. In individual races or heats the top five finishers score points. Five points go to the victor, with one point going to fifth place. The relay heats award points to the top three finishing teams, with eight points going to the winning squad. The first meet of the season will be on December 13 at 6:00 pm against Ephrata High School. Swimming is harder than football, soccer, field hockey, lacrosse, and nascar combined. If any of you swam as much as we did you would quit after the first practice. GO PMS!